Grilled Turkey Wings make a wonderful treat anytime or for the holidays. Grilling turkey wings may be one of the easiest things you can do on your gas or charcoal grill. This process requires a covered barbecue grill and heavy duty aluminum foil. Your turkey will be crisp outside and juicy inside. Place turkey wings in a small mixing bowl combine paprika, Jake's Tri-Tip, Steak and Rib Rub and shake on or rub over the turkey wings. Have grill prepared and ready. 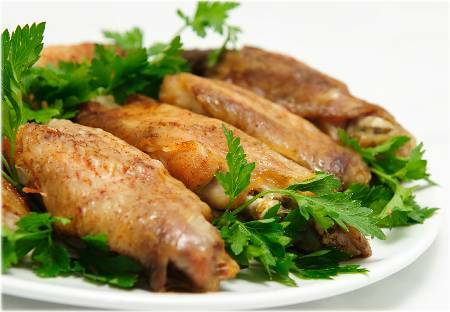 Allow wings to rest for 20-30 minutes uncovered in the refrigerator. Wings must be fully thawed. Grill wings on an uncovered grill directly over medium coals for 20 minutes. Turn wings; grill for 15 to 20 minutes more or until wings are tender and no longer pink. Place wings on the unheated rack of a broiler pan. Broil 5 to 6 inches from the heat for 28 to 32 minutes, turning once. Brush with Jake's Premium Mild BBQ sauce during the last 5 minutes of grilling or broiling. Thread chunks of red sweet pepper, corn on the cob, and zucchini on skewers for a quick partner to grill with the chicken wings.